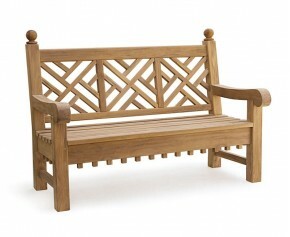 Featuring beautifully scrolled arms and an intricately designed back rest, this decorative garden bench also known as a teak Chiswick Chinese Chippendale bench offers a little more design than standard benches and would look really stylish as a focal point in any discerning home or public space. 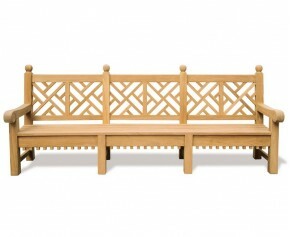 Elegant and decorative, these Chiswick benches will adorn your outside space with style. Featuring intricate lattice backs and gracefully scrolled armrests, these teak garden benches are a luxurious choice for your outside space. Made from grade-A teak, our Chiswick benches are not only extremely durable but also weather resistant and can remain outdoors all year round, ensuring minimal fuss and fruitful use. Invigorate your space with these Chiswick benches, ideal as a stunning focal point. Designed with comfort in mind, these teak garden benches will bring you long lasting garden relaxation for years to come. 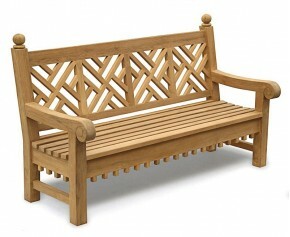 View our range of Chiswick benches below.